Like blowing the whispy seeds from a dandelion, only a lot more dramatic, this activity set encourages users to wish big. Simply write your hopes, wishes, and what-ifs on the wish paper and roll into a tube. A bright "wish platform" becomes the staging ground for your inspiration--place the tube of paper on the pad, then light the top edge of your wish. As your wish burns, the ashes are taken by the wind. Want to wish on something more specific? This set makes a unique and thoughtful gift for a couple of newlyweds, a recent graduate, someone recovering after an illness or surgery, or the starry-eyed optimist with their heart set on changing the world one wish at a time. Made in Portland, Oregon. "Not intended for use by children. Burn on platform card provided. Never leave fire unattended. Dandelion Flying Wish Paper is meant for indoor use." 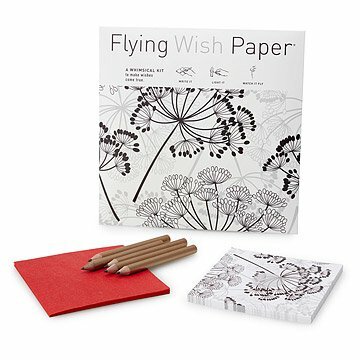 Dandelion Flying Wish Paper includes 50 flying wish papers, 25 wish platforms, 5 pencils, and instructions. Matches not included. I used this for a self-reflection group and it is a delightfully fun and meaningful way to free your thoughts, wishes, and dreams. The materials are of good quality and the instructions were clear. Great activity! Check out the size as one reviewer expected a larger size but I like the smaller size personally. Good value as well. I "wish" the paper was more colorful! Practiced using the flying wish paper to use New Years with friends and family. Shared the idea with several who loved it. Exciting little activity that is also meaningful. Nice to use yourself if you meditate. I bought this for a gift, when it arrived, I was slightly disappointed in the size of the package. However, the gift recipient loved it. All the instructions are clearly listed and the packaging was prettily decorated. Like blowing the whispy seeds from a dandelion, only a lot more dramatic, this activity set encourages users to wish big.